"The Indian automotive industry will have to walk with the rest of the world and change in tune with current times. 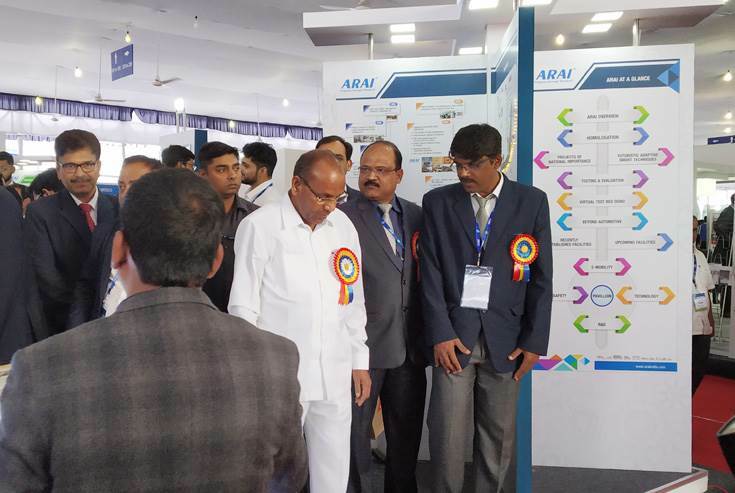 The government will not adopt policies that are detrimental to the interests of the automotive industry," said Union Minister for Heavy Industries and Public Enterprises, Anant Geete said today at SIAT 2019 in Pune. Geete said the government will ensure balance between the interests of users and manufacturers of automobiles and make policies that will be friendly for either side. 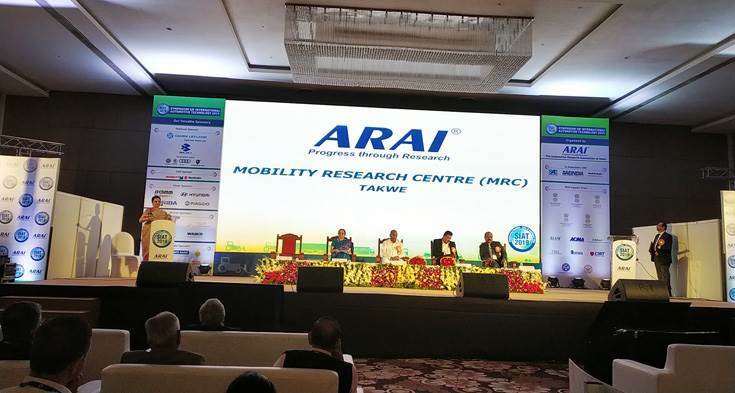 Geete was speaking as the chief guest at the valedictory session of the three-day Symposium of International Automotive Technology (SIAT 2019) hosted by the Automotive Research Association of India(ARAI). Dr Rashmi Urdhwareshe, Director of ARAI; SRJ Kutty, Senior General Manager, Tata Motors; Anil Sahasrabuddhe, Chairman of All India Council of Technical Education(AICTE) and A. A. Badusha, convener of SIAT 2019 were present on the occasion. Geete commended the automotive industry for its role in the Government's 'Make in India" initiative and for its contribution in employment generation. He said the high calibre work which the ARAI is doing shows that Indian engineers and technologists are at par with their global counterparts in the area of technology development. He released a publication – Global Auto Safety Regulation - SIAT 2019 edition – and gave away honours for best technical papers on safe, smart and sustainable mobility as well as felicitated the winners of Poster Presentation Competition for students. Anil Sahasrabuddhe said AICTE is moving towards making the syllabus of engineering education more relevant for industry needs and ensuring the percentage of employability of engineering graduates from the present 25 to 50 or 55. Students of today are keen on going beyond classroom learning and want to explore knowledge in real life situation. He said the teachers will also need to upgrade and refresh their knowledge to help reach this goal by participating the teacher training programmes of AICTE. Sahasrabuddhe unveiled the e-learning module on fuel cell technology conceived by the ARAI Academy. SRJ Kutty underlined the qualitative change in the research papers received for the conference as the subjects of these papers have moved from the traditional subjects to topics such as noise-vibration-harshness, climate control and crash and safety. This is an indicator that India is now ready to collaborate with world for technology development. A virtual reality documentary on ARAI's proposed National Automotive Technology Museum which the organisation will set up with the support of Government of India. Ms Urdhwareshe presented an outline of the upcoming 110-acre Mobility Research Center of ARAI at Takwe near Pune, which will house state-of-the-art facilities like test tracks, test tracks for autonomous vehicles, tyre and wheel research and development, fire safety research lab, hydrogen and fuel cell technology center , hydrogen dispensing station and cylinder testing facility. It will primarily provide space an support to industry innovators apart from facilitating clean and green energy solutions. It will work towards 'Connect Bharat'. The new facility, which is being set up to conduct research, development, testing and certification operations for the automotive industry, will include several test tracks for homologation suitable for automotive and off-road vehicles. There are also plans to develop a special track for autonomous vehicles. There will also be a tyre and wheel testing Centre of Excellence which will cater to the homologation and R&D needs in the area of tyre rolling resistance, tyre-road interaction dynamics and tyre technology suitable for India's environment and road conditions. A hydrogen and fuel cell technology test centre will house a dedicated hydrogen engine test cell, fuel cell station, onsite hydrogen generation facility, and a purification system and hydrogen dispensing station. A national cylinder testing station is planned to conduct hydrostatic testing to check cylinders for leaks, structural faults, durability, and corrosion. MRC will also provide a dedicated analysis and benchmarking facility for OEMs to benchmark vehicles and powertrains to improve their products. It will provide space and support to investment partners and research scholars who are interested in developing new technologies towards safer, smarter and sustainable mobility to the society with minimal impact on the environment.